A pub which closed down four years ago in a "damp and dingy" state has been named the best in Britain. The Crown and Thistle in Gravesend, Kent, was re-opened on Easter Saturday in 2001 after a major refurbishment. The bar was named National Pub of the Year on Friday by the Campaign for Real Ale (Camra), whose experts described it as a "superb pub". The competition judges the quality of beer, atmosphere, decor, service, welcome and value for money. The pub, on the banks of the River Thames, was built in 1707 and first opened as a bar in 1838. The first record of it being called the Crown and Thistle dates from 1889. After it closed down in 2000 new owners took over and raised £10,000 to pay for the refurbishment. Co-owner Philip Rush said: "I knew buying the pub was the right thing to do, but financing the project was a different thing altogether. "The Crown and Thistle was in a really bad way when I went to visit it - damp and dingy - so I needed to raise a fair sum of money. "The high street banks that I approached said the town didn't need another pub, and pubs were closing, so what was I going to do that was so different?" Mr Rush secured the backing of brewery Everards and then learned a customer of the drinks distribution company he worked for wanted to invest in the pub business. 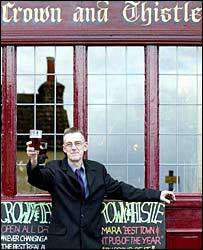 He went into business with that customer, Warwick Gordon, and the pub re-opened in April 2001. Bob Stukins, Camra's pubs director and one of the competition's judges, said: "Unfortunately we hear too many sad stories of pubs closing. "The Crown and Thistle story represents exactly what National Pubs Week is all about - saving the British pub. "The Crown and Thistle is a superb pub that excelled in all of the areas Camra takes into consideration when judging this award."